Preheat oven to 350◦. Pulse walnuts and pecans in food processor until ground. Add oat flour, agave nectar, vanilla extract, apple juice, 1 teaspoon cinnamon and ½ teaspoon nutmeg and pulse until combined. Press nut crust into oiled baking dish, setting aside ¼ cup mixture for nutty crumble topping. Par-bake crust in oven for 5 minutes. In large bowl, toss sliced Pazazz apples with lemon juice. In separate small bowl, mix cane sugar, remaining 1 teaspoon cinnamon and ½ teaspoon nutmeg together. Sprinkle sugar mixture over apples and toss. 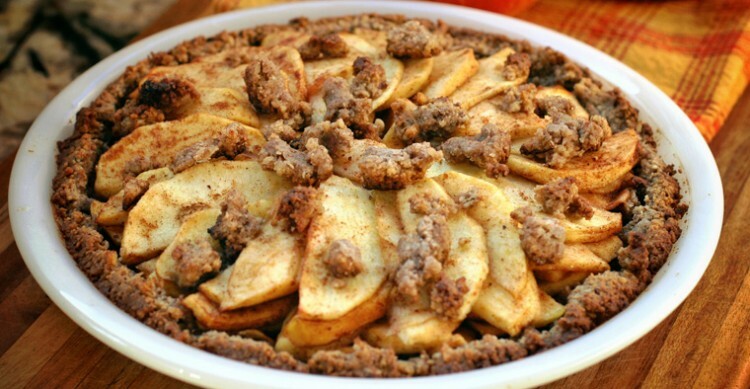 Fill par-baked crust with apples and top with remaining nut crumble and bake at 350° for 30 minutes or until browned.